Herkese merhabalar! Bugün bir "cantamda ne var?" yazisiyla karsinizdayim. Daha önce bu tarz yazilar yayinlamistim, ancak en son Snapchat üzerinden hangi yazilari yayinlamami istediginizi sordugumda en cok istenen yazilardan birisi bu olmustu. O yüzden bugün cantamda neler tasidigima iliskin bir güncelleme yapmaya karar verdim! Hadi bakalim! Hi everyone! Today I'm back with a "what's in my bag?" post. I've already published such a post months before. 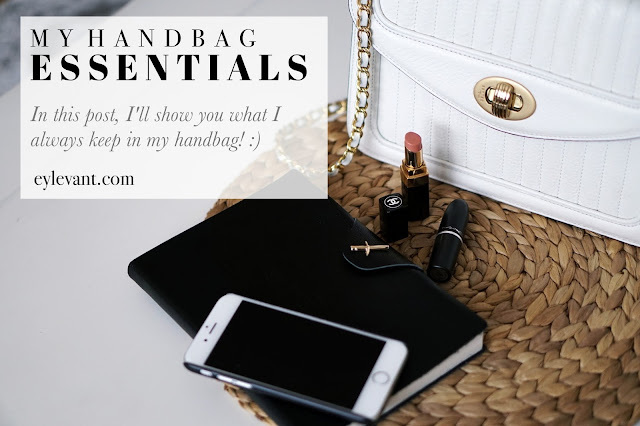 But when I asked you on Snapchat which post you would like to see on my blog, I got lots of replies that you are interested in my handbag essentials. And therefore I decided to do an update and show you what I am always carrying in my handbag! Eskiden büyük cantalar kullanirdim ve dünyayi doldururdum icine - ne gerek varsa! Kücük cantalara gecis yapali sanirim 1-2 yil oldu, ve artik disariya büyük cantayla cikmak bana büyük bir yük gibi geliyor. Kompakt ve en önemli esyalarimi yanimda tasiyabilecegim kücük bir canta benim icin yetiyor da artiyor! Actually I've been used to carry big shoulder bags or rucksacks. But this changed 1-2 years ago when I switched to a smaller handbag. I think it is more compact and everything important that I'll probably need during the day fits into it. DELAGE PARIS. Kasim ayinda aldigim Delage Paris markasina ait bu cantayi - hic abartmiyorum - neredeyse disariya ciktigim her gün kullandim! En sade kiyafete bile ayri bir hava katiyor ve tamamliyor. Biliyorsunuz, giyim konusunda oldukca sadeyim, siyah-beyaz-nötr renkler disina pek ciktigim olmuyor. Bu yüzden kiyafetimi aksesuarlarimla desteklemeyi seviyorum. Ve su kadarini söyleyeyim, Delage benim en en en sevdigim canta oldu. Bu arada bendeki modeli Ginette. Eger ilginizi cekerse kendi sitelerinden cantalari inceleyebilirsiniz: https://delage-official.com/. DELAGE PARIS. Since November, my bag from Delage Paris is my go to one! Honestly - everytime I go out, I take it with me. 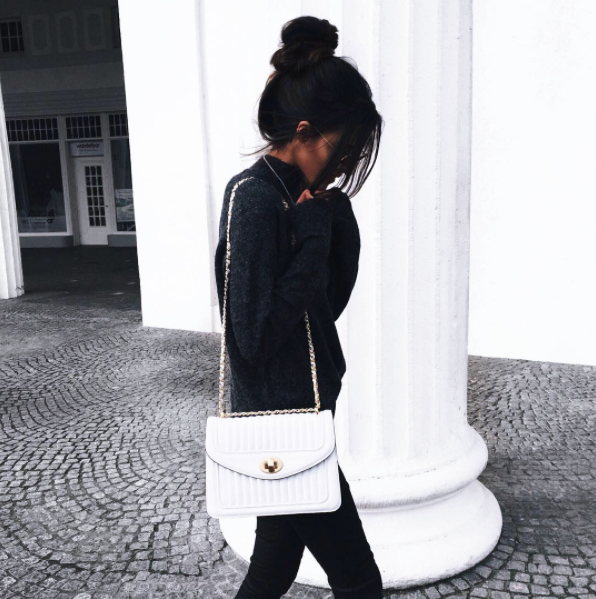 Even my casual outfits look interesting combined with that bag! 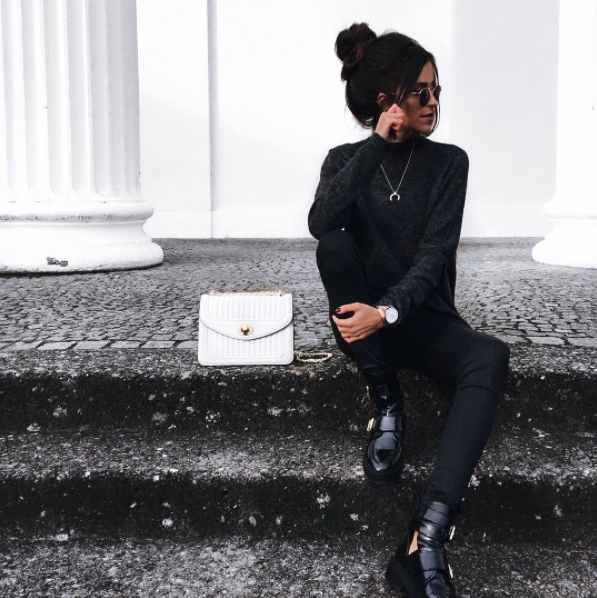 Since I am always wearing black, white or neutral colors, it pops out perfectly. By the way, the model of the bag is Ginette. If you want to take a look at it, you can visit Delage's website: https://delage-official.com/. PURSE. I've been using small wallets for years, they are more compact and don't take much space in my bag. This one I bought from Istanbul last year. I know, it isn't the classic type of a wallet but anyway, I love it. Its color and the oriental design absolutely amazed me! POWERBANK. Gelelim onsuz asla disari cikmadigim bir cihaza: powerbank! Benimkisi Ravpower markasina ait ve bunu yillardir kullaniyorum, bozulma vs. olmadi. Üstelik telefonunun sarjini 4-5 kez full dolduruyor. Sanirim cihazin yeni modelinin tasarimi degismis, ancak buradan ayni marka ve özelliklere sahip cihazi inceleyebilirsiniz. KULAKLIKLAR. Yolda müzik dinleyenler el kaldirsin! POWERBANK. This is one of the most important items in my bag: powerbank! Mine is from Ravpower. I use it for years and it still works - fortunately! It fully charges my phone up to 4-5 times, so it is really useful. I think the design has changed, but you can find a similar one here. EARPODS. Listening to music everywhere I am, everything I do! AJANDA. Ben hala klasik not tutanlardanim. Telefonuma da elbette not alabilirim bazi seyleri, ancak blog, isim ve üniversite dolayisiyla klasik bir ajanda bütün islerimi düzenleyebilmem acisindan cok daha pratik oluyor. Bu ajandayi da ayrica cok seviyorum, markasi Jot It Down (burada). GÖZLÜKLER. Günes gözlüklerim yaz kis cantamda. Ben gözlük kullanmayi cok severim, ayri bir hava katiyor. Ve bu konuda en sevdigim gözlüklerim Ray-Ban Round Metal (burada). DIARY. I always keep my diary on me, sure I could take my notes on my phone too, but I'm still that "classic" type of person and take my notes on paper. There is too much work which has to be organized neatly - my blog, my job and university. And this way I feel more organized. By the way, my diary is from Jot It Down (here). SHADES. No matter whether it is summer or winter, my shades are always with me! I love wearing sunnies and especially the Ray-Ban Round Metal (here) model - those are my favorite ones! AYNA. Kücük Chloé aynam hep cantamdadir! SAKIZ. Naneli bir seyler illaki hep yanimdadir. Özellikle yemekten sonra daha fresh bir his icin naneli sakiz veya sekerler vazgecilmezim! Airwaves Strong bu konuda epey iyi, ancak Vivident Extra da favorilerimden! MIRROR. A small pocket mirror by Chloé is always in my bag, too! CHEWING GUMS. Another must-have in my bag are mint flavoured chewing gums! Especially after having a meal, there is nothing better than a gum which insures a fresh breath. In this case, my favorite ones are Airwaves Strong and Vivident Extra. PARFÜM. Kozmetik konusuna gelirsek bence bir kadinin yaninda tasimasi gereken en önemli sey parfümüdür. Bu aralar en cok kullandigim ve en sevdigim parfüm Zadig & Voltaire (burada). Aslinda yanimda tasimama gerek yok, zira kokusu asiri kalici, hatta su ana kadar kullandigim en kalici parfüm diyebilirim - Chanel'inkileri bile sollamis. Tabii ki bütün parfüm flakonunu yanima almiyorum, bunun yerine Travalo'ya (burada) dolduruyorum. Bu bir parfüm atomizeri, altindaki aparat sayesinde kendi parfümünüzün üst kismini cikararak kolaylikla icine doldurabiliyorsunuz. Travalo, ruj büyüklügünde oldugundan cok pratik oluyor cantada. PERFUME. Actually I don't carry many cosmetics in my bag, but my fragrance is one of my must-haves. Lately I've been using the fragrance by Zadig & Voltaire (here) and it has become my favorite scent ever! I truly can identify with that scent. But instead of carrying the whole flacon in my bag, I fill my Travalo (here) with my fragrance. This item is soooo compact and useful, that I can absolutely recommend it to everyone. It is a perfume atomizer and allows you to carry your fragrance in a smaller bottle (lipstick size). Iste bunlar benim cantamdaki vazgecilmezlerim. Sizin asla yaninizdan ayirmadiginiz esyalariniz neler? Those were my necessities I can't leave the house without. Which essentials do you keep always on you?